With our ever expanding knowledge on the genome from DNA sequencing, it is now clear that mechanisms regulating the functional output of the genome go far beyond its linear sequence. The packaging of the chromatin, its dynamic interactions with proteins and RNAs, and modifications to histones all play important roles during organism development, environment adaptation and cancer formation. For this purpose, we take the "imagenomics" approach, developing new tools to visualize the dynamics of specific genomic elements and their epigenetic status in living cells. These techniques will perfectly complement sequencing-based approaches and fundamentally advance our ability to understand the regulation of genome function. 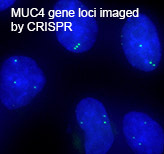 Highlights of our recent work include the development of the CRISPR imaging technology for endogenous gene loci. Cell signaling networks are the basis of cellular activities and, ultimately, the everyday life of an organism. As the activities in a signaling network are often highly dynamic in time and heterogeneous in space, with the same signaling molecule functioning differently among cellular compartments, we take a microscopy-based approach to map the localization and activities of endogenous signaling components. We are particularly interested in understanding the activity regulation in the G-protein coupled receptor signaling pathway. Modern structural biology methods, such as X-ray crystallography, NMR and cryoEM, are powerful tools to determine the structure of biomolecules ranging from small proteins to large complexes. However, it is still a major challenge to connect these in vitro isolated structures to their native cellular counterparts. Funded by the NIH Director's New Innovator Award, we are developing a new approach based on super-resolution optical microscopy to characterize the architecture of molecular complexes in situ. Especially, we are interested in studying the nuclear pore complex, the centrosome, and the cilium transition zone structure. In order to visualize the structure of molecular complexes, interactions between protein molecules and activities of signaling molecules, we have broad interests in creating new fluorescent reporters based on small molecules, DNA/RNA aptamers and nanobodies. We have developed a stategy based on split fluorescent proteins that enables systematic fluorescent tagging of endogenous proteins in mammalian cells at a large scale. We are also developing activity and protein localization reporters based on the specific interaction between the target protein and an intracellularly expressed small binder such as nanobodies. The diffraction of light limits the spatial resolution of conventional fluorescence microscopy to several hundred nanometers, leaving many subcellular structures too small to be observed in detail. 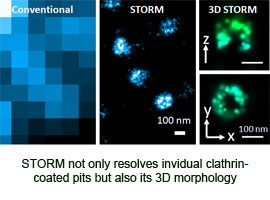 To overcome this limit, we have developed the Stochastic Optical Reconstruction Microscopy (STORM) technique. Using photoswitchable fluorescent probes and single molecule imaging to determine their 3D positions, it has improved the spatial resolution of optical microscopy by more than an order of magnitude (~20 nm), approaching the size of a protein molecule. We are currently focused on (1) new experimental approaches and image analysis algorithms to record fast processes in living systems, (2) quantitative super-resolution microscopy to count the absolute number of molecules in a structure, and (3) better super-resolution microscopy in thicker tissue samples.